When I saw the movie “Pandora”, I felt it could have been filmed at El Yunque. Through the ethereal atmosphere of the forest, a portal to another dimension is hidden behind the passing clouds. Its spectacular views encompass the blue waters of the northern coastline and the easternmost tip of Puerto Rico. There is a veil of mystery that characterizes the prominent mountain, holding hidden secrets. Officially known as the Caribbean National Rainforest, the 28,000 acres woodland was originally named by the Indian Taínos after the benevolent spirit of their god Yuquiyu, meaning in their language, forest of clouds. During the time Spain was ruling the island, the colonizers confused the name with El Yunque. In 1905, after the Spaniards had granted Puerto Rico to the United States, the oldest reserve in the occidental hemisphere became the only national rainforest in US territory. Located in the Sierra of Luquillo, El Yunque has been a focal point of UFO and paranormal sighting since the Taínos were the first inhabitants of Borikén, believing them that the forest was a sacred mountain because its highest peak was the dwelling place of their deities. UFO researchers claim that our indigenous communicated with extraterrestrials, teaching them these “ancient astronauts”, known as aliens, the physical and spiritual laws of the universe. The Taínos believed that one of their space crafts may have crashed in the rainforest during the earlier times and that the aliens were gods. Much later the ship disappeared, but the energy merged with the aura of the forest. When Christopher Columbus discovered the island, he wrote in his journal that during his journeys, he saw strange lights coming from the mountain of what is known today as El Yunque. A mystical forest is an excellent place for paranormal activities to take place because of its place on the south side from the Bermuda Triangle. Strange Mayan figurines were mysteriously found in Puerto Rico. Just like the Mayan Indians, ufology analysts believe extraterrestrials are attracted to the energy that is found in the forest. Known as one of the most visited places by UFOs in the world, serious investigations of this strange phenomenon are happening in Puerto Rico. Even though the mystery of the rainforest remains strictly secretive to the government; there is a theory that a subterranean extraterrestrial base exists inside the forest. Some scientists and researchers speculate that El Yunque is a UFO geomagnetic radiation base. Geomagnetic is known as the energy produced by a magnetic field that provides vital protection for keeping the earth atmosphere in the place. Throughout the years, many people have seen strange lights hovering over the rainforest, and there have been several cases reported of people having encounters with reptile beings, humanoids figures and bizarre creatures inside El Yunque. Part of road 191, allowing the entrance to the forest is prohibited to the public and at night, witnesses have reported strange military activity. The forest is closed every day at 6:00 PM and there is a threat of shooting if trespassing takes place. The mysterious forest serves as the home of thousands of endangered species of the island’s fauna and floral. While gleaming leaves surround you, shadowy trails sheltered by gigantic trees and the dim light of the sun rays, sparkling stones and wild vegetation; its beautiful and breathtaking scenery are accompanied by the melodious sound of the coquí, the puertorrican tree frog. However, many people are afraid of visiting the forest. What is the military personnel hiding inside the rainforest and what is about El Yunque that interests UFOs? Over the years, many alien spaceships sightings have been reported, but the latest case that created controversy was in February of 1988 when a group of locals heard a loud sound. They all saw the crash and explosion of a UFO. The next morning, a television station showed up to videotape the incident; getting the military involved right away and announcing the television news right before airing it that their shooting had mysteriously disappeared. During the various times, I have visited El Yunque, I haven’t witnessed any paranormal activity yet. However, I know some locals that have seen UFOs flying over the mountain. There is much controversy about the activity that takes place there. Strange balls of light coming from the mountain have been seen, many people have mysteriously disappeared and were never found, a military secret place is hidden inside the forest, sightings of the chupacabra and grey aliens have been reported, as well as numerous cases of abductions of extraterrestrials. It seems our government have been secretly collaborating with them for several years. Why are they keeping this from the public and when will they disclose the true about these beings? Who are they and why are they there? This entry was posted in El Yunque, Legends, The Tainos and tagged aliens, aliens abductions, Caribbean National Rainforest, chupacabra, el chupacabra, El Yunque, extraterrestrial base, extraterrestrials, flying saucers, forest of clouds, grey aliens, greys, military base, paranormal activity at el yunque, paranormal activity in puerto rico, reptile beings, Sierra of Luquillo, space crafts, spaceships, Taínos, UFO, ufo's sights, ufology, UFOs sightings, Yuquiyu. Bookmark the permalink. 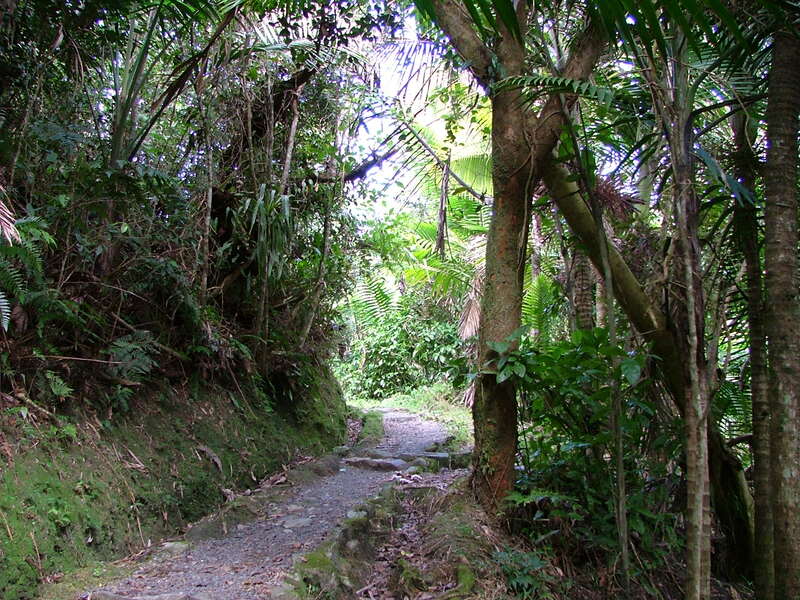 Your description of El Yunque is beautiful and alluring–I felt transported to the Island of Enchantment. I look forward to reading more about the mysterious “guests” on the island! Puerto Rico should hire you as their public relations officer to lure more tourists. i saw a large reptile run accross the top of a trailer back in the mid 80s . Thanks for sharing it. Were you scared? Did the reptile see you? I was wondering why my other post about my experience on the mountain was removed and only the one about the reptile remained? Sorry it took me so long to reply. It may have gone to the spam folder. You are welcome to re-send it. Amazing! What year was this? the jungle and the caves. i will never forget those times. i wish i could go back there for an expidition and see how it is now. In December 2015 my friend and I were walking the path in the El Yunque Rainforest with his 18 month old Standard poodle who stands about 6ft on his hind legs,and is extremely friendly and excited to meet everybody. As we were walking, there was a couple in the distance walking toward us. PJ (the dog) was excited and started to run to approach them. He went right up to the lady and greeted her as he does with everybody, but when he saw the man he looked at him and started to shake nervously with his head down and tail tucked. I thought the large e cigarette device in his hand may have scared him so I asked him to give it to his friend. The man handed it to the lady and said he’ll be ok and went to pet him. No sooner than the man put his hand out PJ TOOK OFF FULL SPEED and WHIMPERING! When he got to a safe distance he turned around looked at me and layed down in place as to say “I’ll wait for you here”! My friend and I were dumbfounded as to what just happened. We both felt that something was very off about this man. We both looked at each other and did not try to make conversation we just took PJ ‘s reaction at face value and continued onward. As we walked away we both said to each other ” what the hell was that?” We both couldn’t help but describe the man as oddly tall, blond hair with beautiful gray blue eyes. Friendly but off…hmmm. His friend or wife was a black woman very kind and soft spoken. PJ had no alarming reaction to her at all or to anyone we met in Puerto Rico the entire week. Who or what was this man? That was the only question that we could ask each other. Thank you for sharing your experience.I am certain we are not the only living on this Earth. I love hearing stories like yours to confirm it. Please I hope you get my message. I believe what your saying is true. Me and three of my closes friends hiked 30 minutes into El Yunque to swim near the water falls. (Visited May 2016/around Mother’s Day) We took lots of photos. Hiking in we felt such a heaviness as if something didnt want us there. The feeling was so heavy that one of friends actually went back to the car 15 minutes into the hike. To make a long story short, I didnt look at my photos until the next day after breakfast. To my horror there appeared in full flesh another person. The closer I zoomed in I realized that the person has no pupil etc. My friend took the photo using my cell phone as I posed in front of the camera. No one else was around us in sight. It was just the four of us when the photos were taken. There’s also a second photo of ghostly figures and a face of what many would call a, “demon”. But the most interesting thing about the fifth person is that it appears to be a female Indian looking at my friends cell phone while reaching out to touch it with her finger. I wish there was a way to upload the 2 photos. Im searching for answers. Im willing to show you the photos. Im a very spiritual person and could never lie about what happened on that mountain. Hi Sharloh, I was very impressed reading your comments. I would love to see those pictures. All I know is that the energy of the mountain is supposed to be sacred. That is why it was called El Yunque, in honor of Yocahu, who was the tainos good god. However, I also believe we are surrounded by evil spirits. Edwin, thanks for sharing your experience. I believe they are among us.